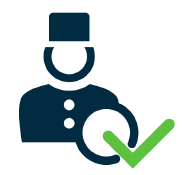 It is the easiest, most effective tool to gather your customers’ opinion, identify and start working on what needs attention and improve your hotel’s reputation. Quickly react to your guests’ negative comments, maintaining your brand’s image intact. Obtain better reviews in sites like TripAdvisor and better position your hotel. Use the voice of your guests to train and motivate your staff. Get a real time, bird eye view of every area of your hotel. Keep your staff informed about performance and necessary results to reach a given goal.